Gold price is chiefly under the influence of some economic data such as Conference Board’s Consumer Confidence and August Comex gold futures. 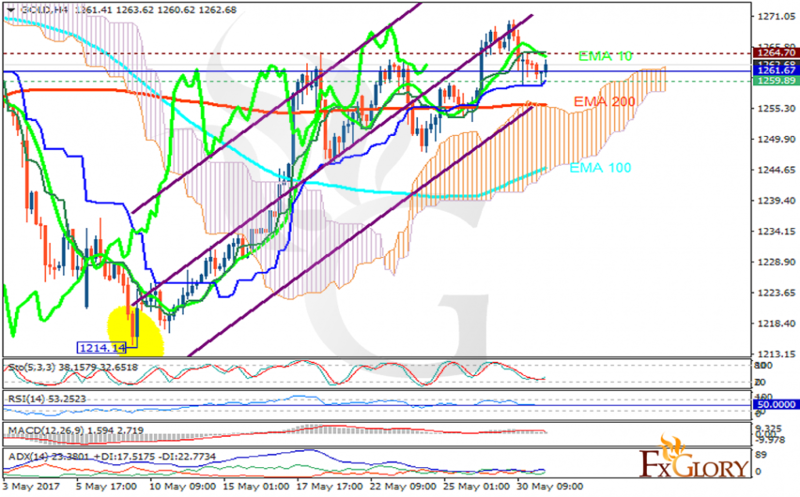 The support rests at 1259.89 with resistance at 1264.70 which the weekly pivot point at 1261.67 is located in between the lines. The EMA of 10 is moving with bearish bias and it is above the EMA of 200 and the EMA of 100. The RSI is moving horizontally on the 50 level, the Stochastic is showing upward momentum and the MACD indicator is in neutral territory. The ADX is not showing any clear signals. The price is above the Ichimoku Cloud and below the Chinkou Span. The Tenkan-sen is showing a horizontal trend while the Kijun-sen is showing an upward trend. Short positions are recommended targeting 1258.